This Translation Suite packages five different translation tools into one super-functional product. The program integrates into MS Office applications so your users can translate documents, emails, web pages and more. Schools and government agencies are eligible for multilicense discounts (50% off). This suite of translation software tools lets you translate virtually anything that crosses your desk: web pages, emails, documents, slide presentations, spreadsheets, databases and more. You get five complete programs in one affordable package. Translate words and passages while in meetings, it's that fast. Translate entire documents, regardless of format. Send and receive email from foreign colleagues. Understand websites written in other languages for the first time. Improve your own language abilities. Be more confident in business or social situations where different languages are used. Create sales and demonstration materials like pamphlets, websites and slideshows in multiple languages to reach all your audiences. Save money by doing it all in-house rather than hiring expensive translation services. IdiomaX Translator: This intelligent program translates whole documents, not word by word as most programs do, but by analyzing complete sentences. It recognizes and applies grammar rules, conjugates verbs, establishes agreement between nouns and adjectives, and takes idioms and language patterns into account in order to get a more accurate translation. IdiomaX Office Translator: Works with Microsoft Office applications (Word, Outlook, Excel, PowerPoint, FrontPage and Access), as well as WordPerfect and Lotus WordPro. You can translate documents, emails, slides, spreadsheets and database fields directly from those applications. Compatible with Office 2000, XP, 2003, 2007 and 2010. IdiomaX E-Mail Translator: Translate e-mails from MS Outlook and Outlook Express. Communicate across language barriers and in record time. IdiomaX Web Translator: As you navigate Internet Explorer or Mozilla Firefox, this translation software lets you translate the active web page, the whole text or portions of it. 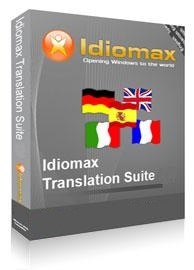 IdiomaX Translation Assistant: For translation of single words or phrases from any Windows application, it's a fast and efficient tool to use when entire document translation isn't needed. Simply and efficiently translate your promotional and advertising materials into the five major languages: English, Spanish, Italian, French and German.